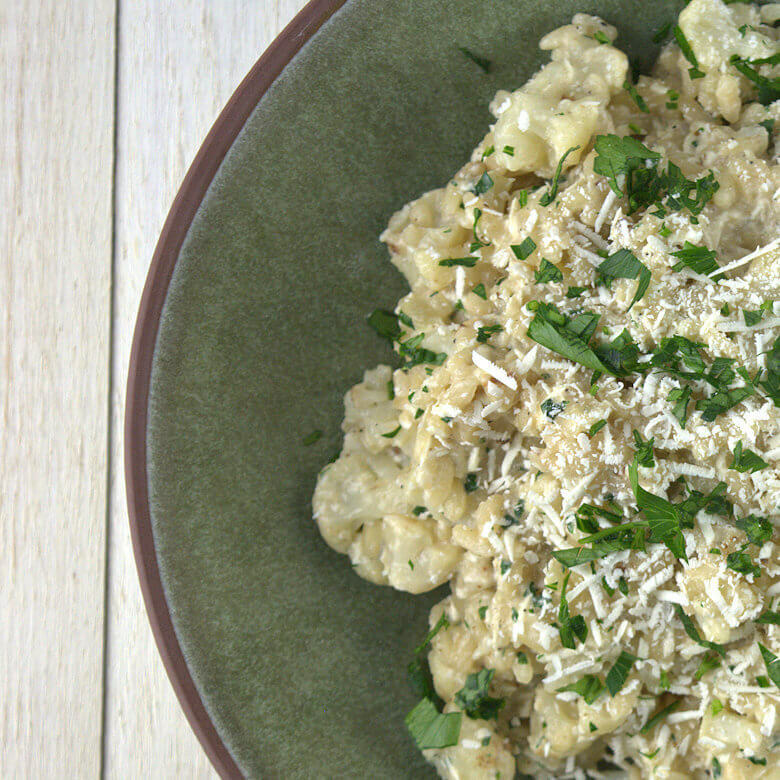 Let’s elevate the status of the cauliflower to a Mediterranean favorite; Cauliflower Risotto with Mizithra Cheese. Or we could call it Risotto Blanco with a lot of vegetables and a nutty Mizithra cheese sprinkle. You most likely think I am nuts, when I tell you that I love cauliflower, just cooked in water and salt or with a light cheese sauce. Don’t be surprised if you see me eat it a few days a week, when I am home alone. And when I am really hungry I can eat an entire head of cauliflower. I don’t do this very frequently though, but I do consider this a quick-and-easy go-to meal that fills me up, without the calories of a fast-food meal. In this Cauliflower Risotto with Mizithra Cheese, I made the cauliflower play the lead role, but added some carbs and flavor. The carbs are coming from the risotto and the flavor from the roasting the cauliflower, from caramelizing the onions, and from the cheese. The rice will give the vegetable more substance and worthy of serving to guests or family members. One way of eating healthier is to changing the ratio carbs:non-carbs. Most risotto dishes are composed by making a risotto and add something to the rice. Change that around, make the addition become the main ingredient and the rice the addition. That way you’ll have less carbs, but still the comfort of the carbs and you’ll have more flavor. After all, rice on its own is not very flavorful. If I were you, I would say, cauliflower does not have much flavor either, so how about that flavor of yours? This is what I did – rather straightforward. Add the rice to the onions and cook the rice according to the directions by adding vegetable or chicken stock. Have you ever heard of Mizithra cheese, or Myzithra; either spelling is used? It is a very interesting cheese. Extremely dry, hard and very nutty in flavor. A long time ago, somebody told me that there used to be, or may be still is, a restaurant change called ‘Spaghetti Factory’. 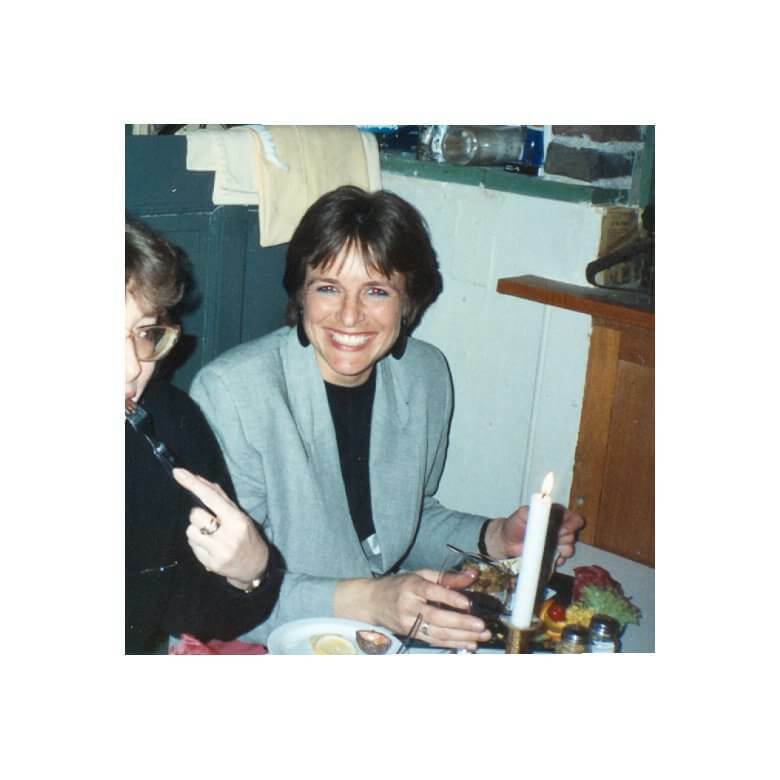 On the menu of that restaurant was a simple spaghetti dish with Mizithra cheese. Nothing fancy, just pasta with the grated cheese and then browned butter sauce poured over the dish. Almost like a Cacio e Pepe, but without the pepe. That particular dish is a great way to experience the flavor and texture of the cheese, as there is not much else that may distract your taste buds. 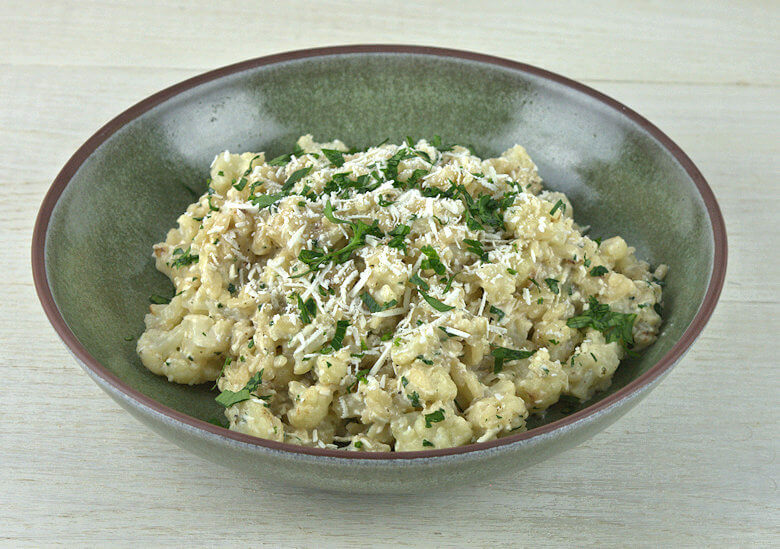 Let's elevate the status of the cauliflower to a Mediterranean favorite; Cauliflower Risotto with Mizithra Cheese. Risotto Blanco with a lot of vegetables and a nutty Mizithra cheese sprinkle. Remove the stem from the cauliflower and break the large florets into small florets, continue doing this until you have the size of florets you like. Warm the vegetable stock and set aside. Sweat the finely chopped onions and minced garlic in a skillet with 1 tablespoon of olive oil (or butter if you prefer) , add the rice and cook until the rice grains become translucent. Add the wine, stir and allow the rice to absorb the wine. Add the stock, ladle by ladle; allowing the rice to absorb the stock, before you add the next ladle. In the meantime, add 1 tablespoon of olive oil to a skillet, and add the cauliflower florets. Cook them on high heat for a few minutes to create a nice brown surface. Lower the temperature and cook the florets for about. 10 minutes or less if you want them rawer. When the rice and cauliflower are done, combine the two and add salt and pepper to taste. 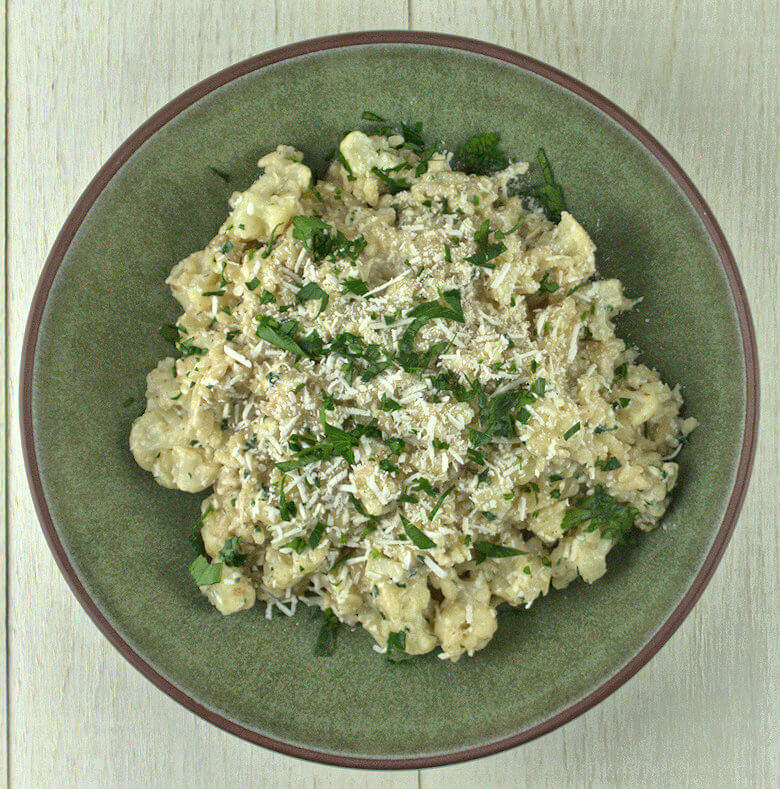 Divide the cauliflower risotto over 2 plates, sprinkle with finely grated Mizithra cheese and parsley.